Big drop off in the mileage this year. Partly because I was crippled for 3 months and partly because I had no big goal. You can see that in 2016, 3 rides account for about 800 miles! That tallies with doing a 600 and 400k on top of the usual commuting. It’s an indication of my long distance cycling progress, that while this wasn’t really a big year for cycling, I “only” did rides to Bristol and Norwich. 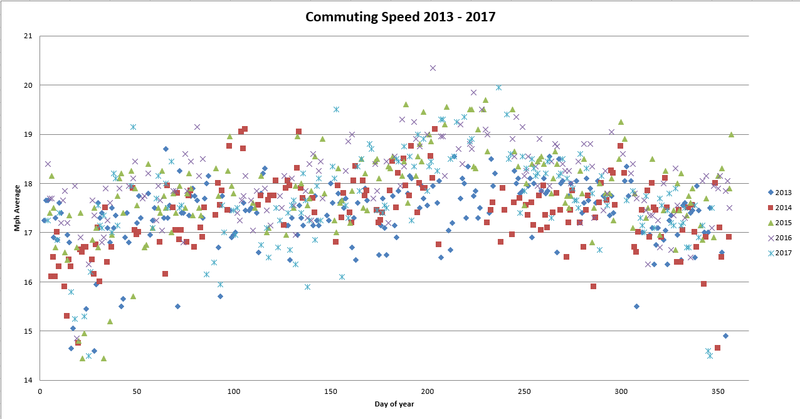 Commuting speed, which still means nothing!